Keep loved ones close wherever you go. For such a special treasure trust Dimples High Def technology to capture true to life fingerprints. Customize with one or more fingerprints. 4mm wide with a round edge for a classic look. Engraving inside the ring in block font. 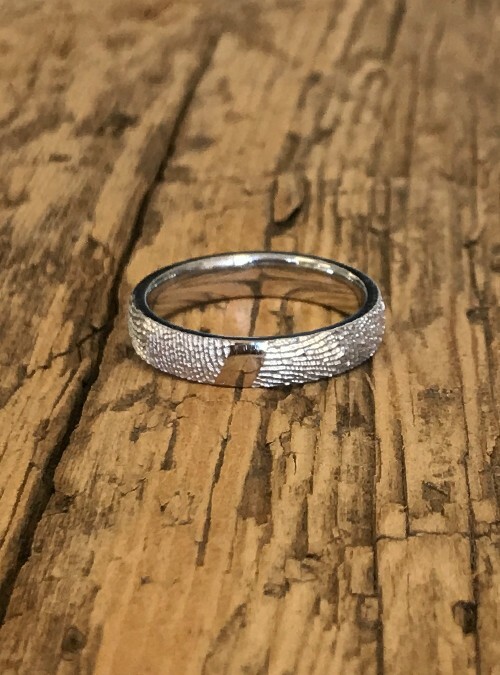 This gorgeous 4mm fingerprint ring will be made to order for you. Each ring is lovingly handcrafted in Canada. Fingerprints in such high definition you’d swear your loved one just removed her/his finger from the metal! Engraving on the inside in block print is available.